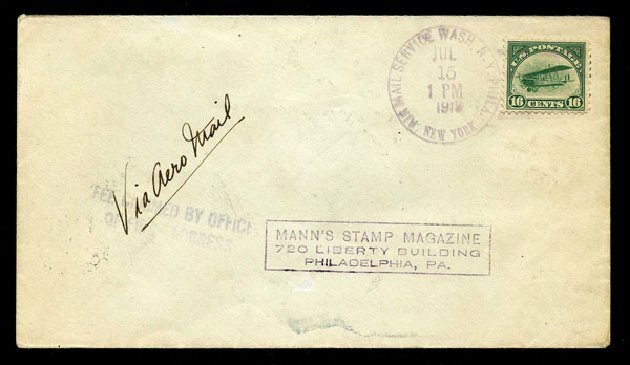 U.S.; Airpost, 1918, 16¢ on First Flight Cover, #C2, fine tied on JUL 15 1918, Washington, D.C. to Philadelphia with hs. Fee Claimed at Office”, on reverse “Send a letter by airplane…It will be a real treat”, slightly dirty, fine. Scott $800. Estimate $150-200. 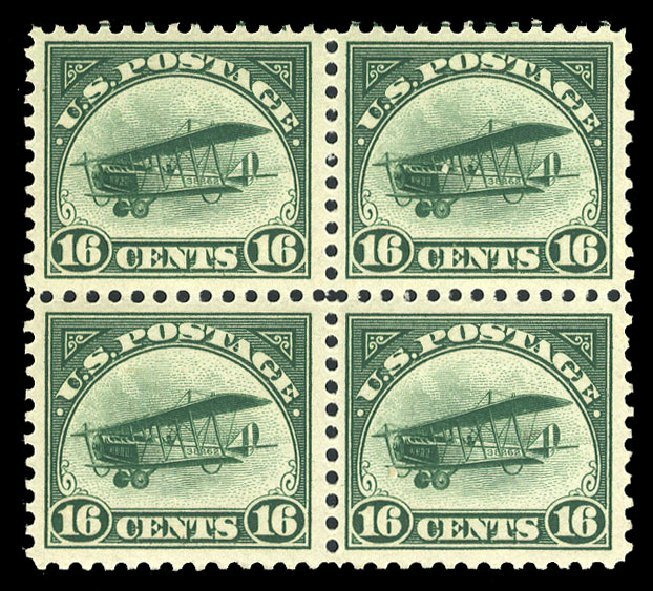 o U.S.; Airpost, 1918, 16¢ With Binghamton, New York Precancel, Block of 81, Scott #C2, full o.g., Fine to Very Fine. Estimate $400-600. 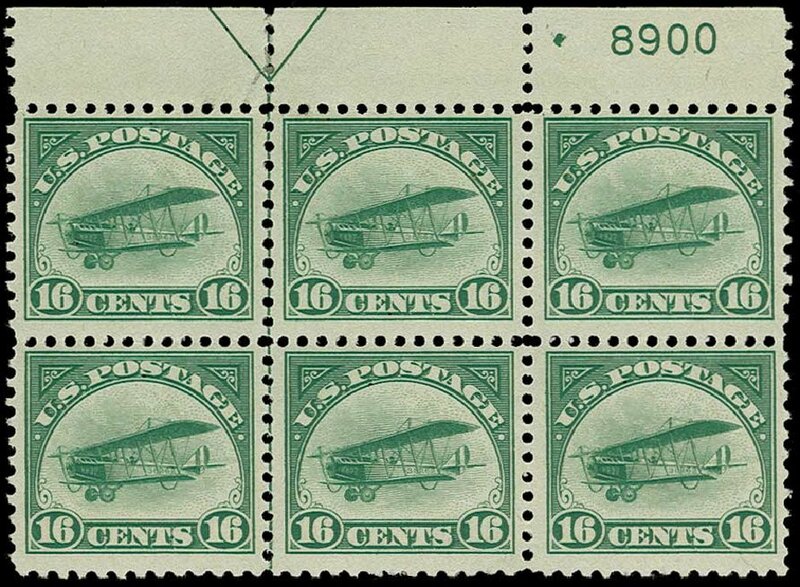 U.S.; Airpost, 1918, 16¢ Green, Block of 4, #C2, n.h., couple gum creases at top, Fine to Very Fine. Scott $520. Estimate price $150-180. 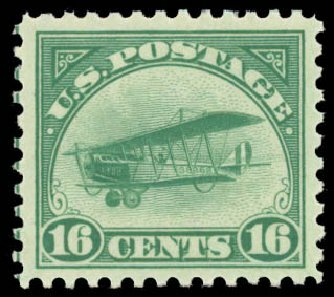 Airmail, 1918, 16¢ green (Scott C2), o.g., never hinged (minor gum bend), lively bright shade, a handsome example, Very Fine. Scott $130. Estimate price $100 – 150. Scott #C2, 16c Green, exceedingly well centered within very wide margins, rich color, o.g., n.h., extremely fine; 2009 PSE certificate (XF-Superb 95; SMQ $425.00). 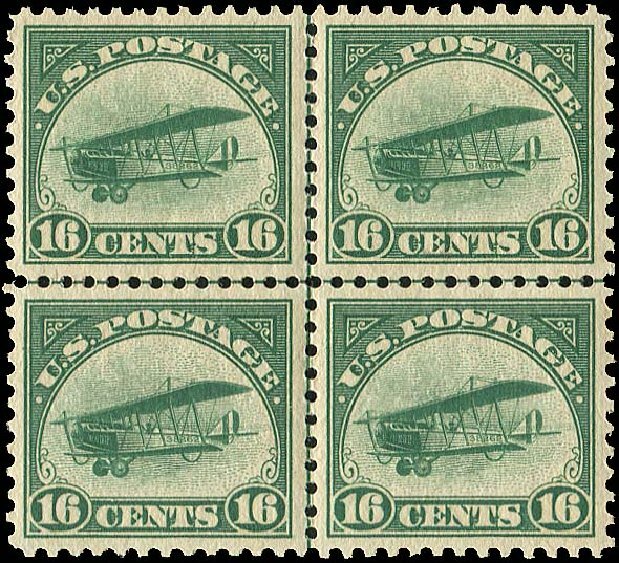 United States – Air Post 1918 16c green, top margin plate number block of six, l.h., well centered, v.f. 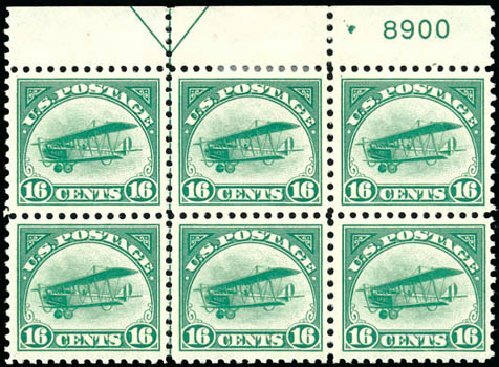 Airmail, 1918, 16¢ green (Scott C2), o.g., never hinged, pristine high quality stamp, with wide margins and vivid fresh color, outstanding, Extremely Fine, 1980 P.F. certificate. Scott $130. Estimate price $200 – 300. 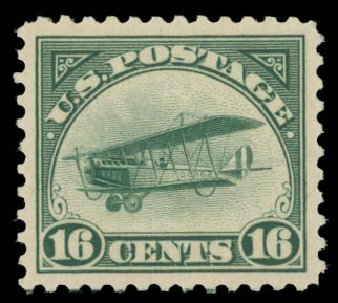 Airmail, 1918, 16¢ green (Scott C2), o.g., never hinged, outstanding GEM QUALITY stamp in a condition rarely offered, with beautiful bright color and nicely balanced margins, Superb, 2014 P.S.A.G. certificate graded 98. Scott Stamp Values $1,300 in the grade of Sup-98. Scott $130. Estimate value $750 – 1,000. 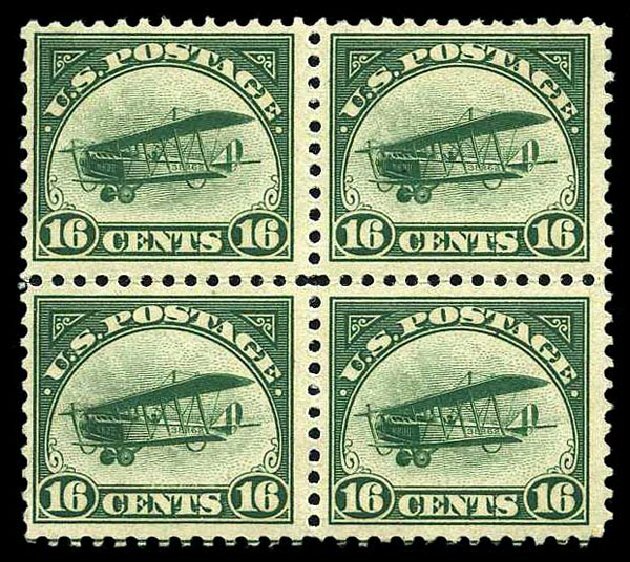 United States – Air Post 1918 16c green, block of four, well centered, n.h., fresh and v.f. Airmail, 1918, 16¢ green. 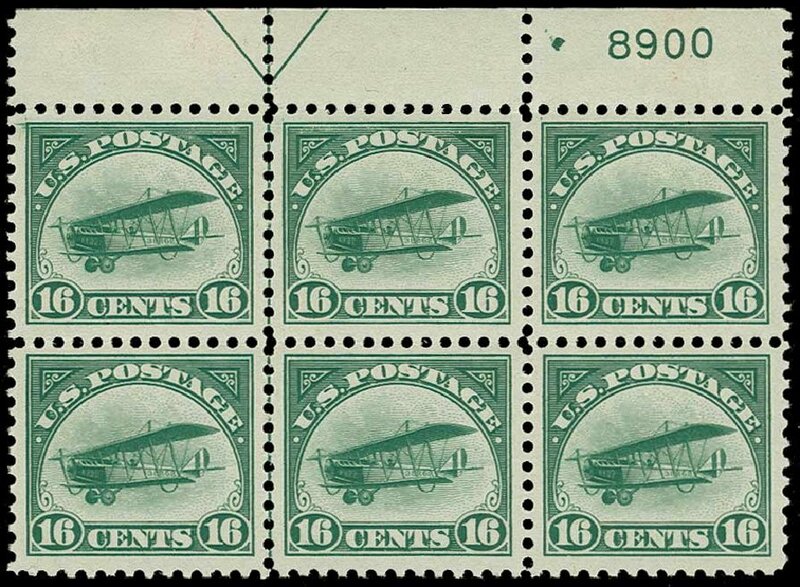 Top margin plate “8900” block of 6 with arrow, o.g., center stamps h.r., others never hinged, beautifully centered, striking deep color, Extremely Fine and choice. Scott No. C2; $900. 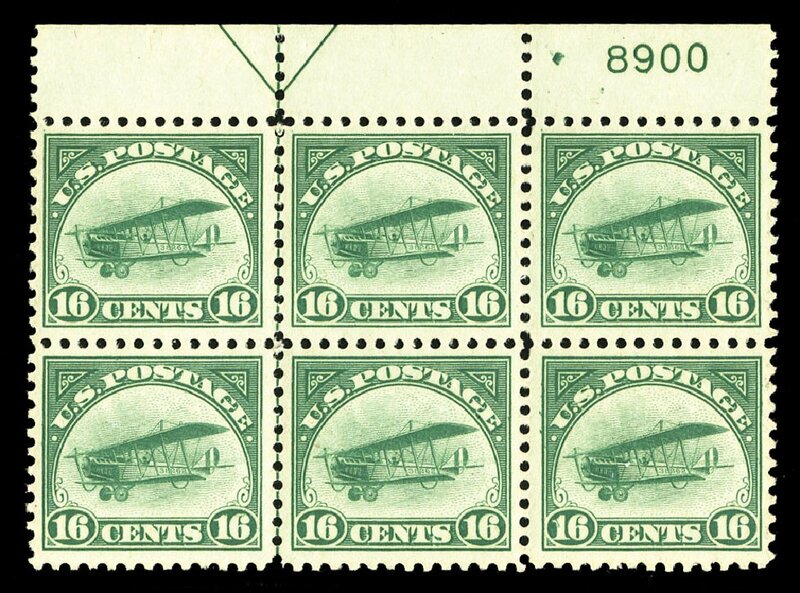 Airmail, 1918, 16¢ green. 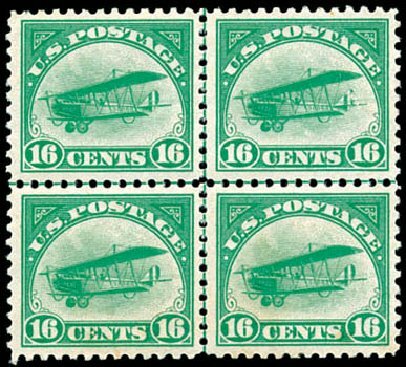 Centerline block of 4, o.g., never hinged (small gum tone spot on bottom right stamp), bold color, Very Fine. Scott No. C2; $520 for singles. 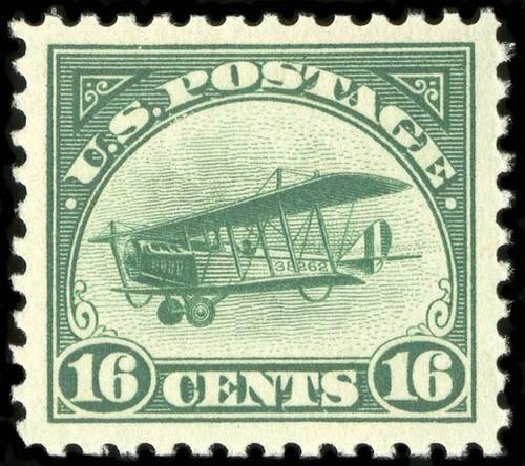 Airmail, 1918, 16¢ green. 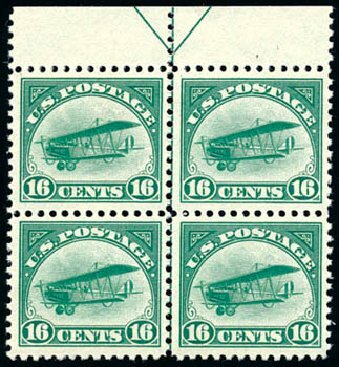 Top margin arrow block of 4, o.g., never hinged, choice centering, fresh with deep color, Extremely Fine, with 2012 P.S.A.G. 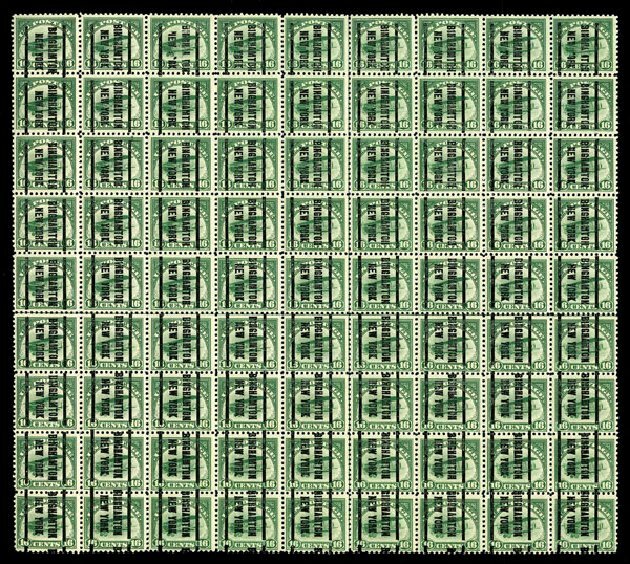 Graded certificate for plate block (90). Scott No. C2; $520.